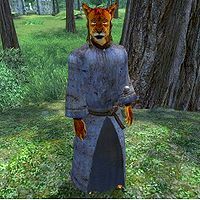 Ma'Raska is a Khajiit thief who is a devout worshipper of the Daedric prince Clavicus Vile. He can be found with his fellow worshippers, Gul gro-Burbog and Anedhel, at Clavicus Vile's Shrine. You can speak with Ma'Raska for information on approaching the shrine. He wears a tattered robe with a pair of sack cloth sandals. He wields an iron dagger and also carries a small amount of gold. Ma'Raska can be found day and night wandering around the shrine to his Lord. Speaking to Ma'Raska before giving an offering to Clavicus Vile will have him greet you by saying; "You approach the Shrine of Clavicus Vile. You should not be here unless you have business with Lord Clavicus." Asking him about the Shrine to Clavicus Vile will have him ask if you have business with the Daedric Prince: "Here we worship Lord Clavicus. Do you have business with the Daedra?" If you claim that you have no business with Lord Clavicus, he will end the conversation after telling you to leave: "Then leave this place, until you have better reason to be here." If you ask him what business you could partake in with a Daedric Prince Ma'Raska will reply; "There are many deals to be made, even with a god. You could find great wealth, or painful death. If you wish to bargain with Clavicus Vile, approach with an offering of 500 gold, and hope the Lord smiles on your offering." At this point, the Clavicus Vile quest will be added to your journal. Asking him about the shrine again at this point will have him remind you of your options in dealing with Clavicus Vile: "Make a bargain or do not. You must choose." Asking Ma'Raska about the shrine after you make a deal with the Daedric Prince to retrieve the sword known as "Umbra" will have him reply; "Your deal is made. Return when you have done your part." Ma'Raska only becomes a non-essential NPC if you complete Clavicus Vile's quest by turning in Umbra and obtain the Masque of Clavicus Vile. If you instead finish the quest by telling Clavicus Vile that you want to keep Umbra, Ma'Raska remains an essential NPC.